Bangalore HR Summit 2015 that was organized by IHRD, was one of the largest HR Summits conducted to bring in HR Professionals, CEOs, founders, researchers and academicians from various companies into a single hall that became a platform to discuss on "The Changing face of HRM". Read on! You will not deny when I say that the HR Professionals in a company play one of the major roles, that contributes to the growth of the company. At the same time, managing people as business resources is not an easy task for the HR department, considering the current scenario of continuous upgradation of trends and changes within the company. 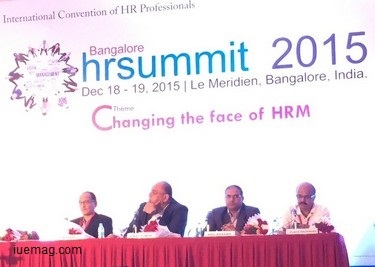 Institute of HRD organized the Bangalore HR Summit on December 18-19, 2015 at Le Meridian, Bangalore, India to help the professionals in the HR department to understand the changing roles of theirs in the current business scenario, measure return on investment of learning & development initiatives and empower them to contribute to increased productivity of the organization through the HR function. The summit began with the National Anthem of India, which created the environment of not just patriotism, but the environment that reminded everyone in the hall, of their responsibility to contribute to the nation’s growth through their performances in their workplaces. The conference began with the welcome address by the Director of Elixir Communications, Mr. Pravin Sathe, followed by the lighting of the inaugural lamp by the dignitaries at HR Summit. To capture the essence of the event and to present the primary issues of major focus at the event were discussed by the keynote speeches of Mr. David Jones, CEO at The Talent Enterprise, and Dr. Raghuram Devarakonda, MD, Accenture Strategy India. David discussed on various aspects of the current scenario’s business changes and the expected results in the upcoming years of how better India could perform with its highest population of youth. In a nutshell, ‘Capturing opportunity of the future’ was the overall concept shared by David. Dr. Raghuram discussed on the results that is expected due to the changes that shall take place in the HR environment. The keynote speeches were followed by the vote of thanks by DR. S K Prasad, Chairman, NAME. Hundreds of HR professionals from India, Asia Pacific, Africa and Middle East took part in the summit, where they not only got to learn from the deliberations by the CEOs and Senior HR Professionals, but also got enough time to network with all the other delegates present at the event. The first technical session which focused on ‘Reshaping HR for future’ and ‘Changing paradigms in HR’, began with the panelists Mr. Raghavendra K, Mr. T N Hari, Mr. Anil Sharma and the Chairman was Mr. Vinay Kumar, Principal Consultant & Director of C2C Consulting. Mr. Raghavendra K, Senior Vice President & Global Head - HRD at Infosys BPO, whose discussion was focused on various changes in the roles of the HR, to be focused in terms of business. He also spoke about how the small acts of the HR team in being accountable, and helping the employees get trained in their convenient ways, can help create a better environment for all to work at. Mr. T N Hari, Head-HR, BigBasket, emphasized on how learning the know-how of other domains can help the HR team to build broader perspectives in managing the employees. He also discussed on the key strategies to build a better organization culture. Changing paradigms in HR was discussed by Mr. Anil Sharma, Group Manger-HR, Synopsys. He provoked the thought of how the level of transparency at the work place can help in better bonding with the co-workers, and how important it is to improve continuously rather than the focus to attain perfection. The technical session was followed by a break for the lunch, which once again led to networking opportunities for the delegates. The next session was a discussion on ‘Digital HR - A boon or a bane’, for which Mr. Praveen Kamath, Global Head-Talent Transformation Wipro BPO, was the chair person, who not only helped create a better platform for the presenters, but created a platform for all the delegates to interact regarding the concept of digitalization. The panelists were Ms. Poornima S P, Group Director-HR & Admin, Tejas Networks, Mr. Aadil Bandukwala, Social Talent Evangelist, Belong.co and Mr. Shivakumar Venkateshwaran, Chief HR Officer IIM-B. Poornima spoke about how the organization still can be productive without the use of social media which is not allowed for the employees to use within the organization. She also shared how digitalizing or using technology at the right instances matter. On the contrary, Aadil discussed on how making the employees feel free to do what they want, can help create the feeling of responsibility in them. Shivakumar discussed on various aspects of building a culture to digitize the process that is generally a paper work. This session was followed by another thought provoking session, which focused on strategic recruitment. Mr. Anil Kumar Misra, VP & CHRO, Fidelity National Financial was the chair person, who set the stage for the panelists by preparing the mindsets of the delegates and sharing the facts and data about the current recruitment scenarios. Mr. Chandrashekhar B N, Group Director of Quess Corp, and Ms. Dhamayanthi N, Associate VP at HCL, discussed on various recruiting strategies. Both their presentations evolved around the strategies to building an employee base that can remain in the company for a longer duration, and also around the new era of recruitment process on social media. Mr. Vijay Anand and Ms. Anitha MS were the host for the day. Vijay Anand, Director of Talkmaster, ensured to be the reason for creating higher energy in the grand ballroom. While he summarized the lessons of each session, he also connected the lessons to the next part of the event that gave a continuous flow for the conference. In between sessions, there were also activities conducted to increase the energy levels. Rewards for a lucky draw contest and for the best questions during Q&A of each session, were a part of the entire event that drew the attention of the participants. The first day of the HR Summit ended with some huge takeaways for the delegates that led them to mentally prepare better for the second day of the event. Stay tuned for more updates on the second day of the event and some of the best moments of the summit. Any facts, figures or references stated here are made by the author & don't reflect the endorsement of iU at all times unless otherwise drafted by official staff at iU. 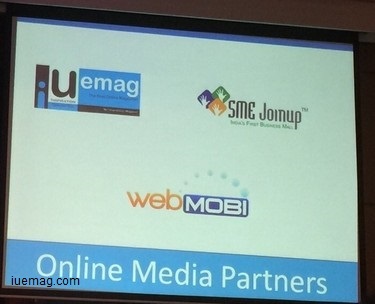 This article was first published here on 20th December 2015.